The family of a murder victim flew to Toronto to recognize the officers who brought his killers to justice. 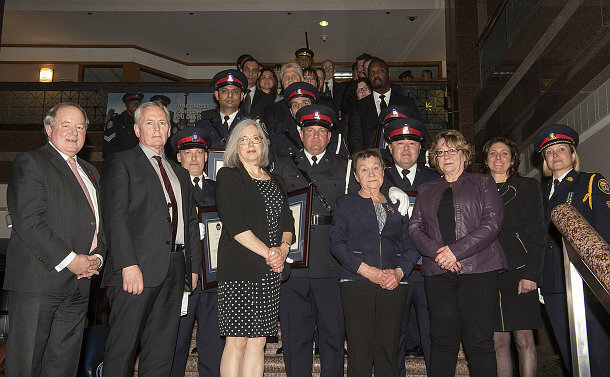 The family of Allan Lanteigne, who died on March 2, 2011, joined in an awards ceremony on March 27, to recognize 26 members of the police and legal community with a Teamwork Award and Letters of Recommendation for their tireless work on the case. Shortly after joining Homicide eight years ago, S/Sgt. Tam Bui was assigned as one of the lead investigators officer in the murder. A conviction was secured in June 2018, two years after the officer left the unit. Michael Ivezic and Demitry Papasotiriou-Lanteigne – the husband of the deceased -- were convicted of first-degree murder and sentenced to life in prison without parole eligibility for 25 years. The two men had been having an affair. Papasotiriou-Lanteigne, who was in Greece at the time of the murder, was a suspect from the outset. With travel records indicating Papasotiriou-Lanteigne was in Europe at the time of his husband’s death, Bui and his team turned their attention to other persons of interest. Det. Leslie Dunkley, who was one of Bui’s partners at the time, found a flight itinerary in the deceased home with the name Ivezic. This led Bui to deduce that there was an element of fraud in his murder investigation. The deceased, who worked in accounting earning about $50,000 annually, had a $2 million life insurance policy. “Some of the stuff seemed exaggerated and out place,” Bui recalled. Ivezic, who was the focus of the investigation, fled to Greece before officers could determine if DNA taken at the crime scene matched his profile. Forced to find a DNA match with him being in Greece, they turned to his son for a parental match. Papasotiriou-Lanteigne is a Greek citizen and Canada did not have an extradition treaty with that country. When he returned to Canada for a legal hearing over the insurance money in November 2012, police arrested him. Working with the Royal Canadian Mounted Police and Interpol led to Ivezic’s arrest in Greece. Bui and Const. Athanasios Tzikas of 14 Division, travelled to Greece to bring him back to face the murder charge in June 2013. Throughout the lengthy investigation, Bui and his team maintained a strong working relationship with Lanteigne’s family who resides in New Brunswick. Bui said the case was lengthy and emotionally draining on the family. 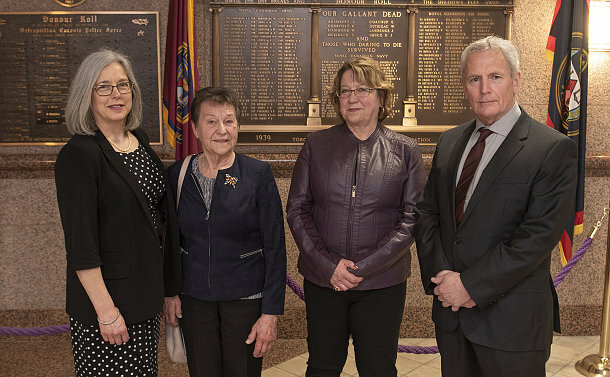 Lanteigne’s mother, Rosaline, sisters Jocelyne Sterritt and Rachel Boyd, and brother-in-law Don Sterritt flew in from New Brunswick for the awards ceremony.